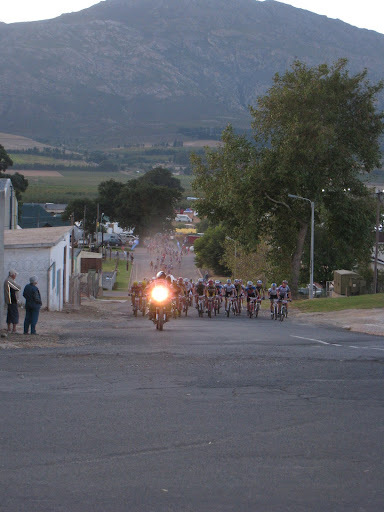 Stage 3 had us leaving the quiet seclusion of Villiersdorp, and heading off the the even quieter and more tranquil town of Greyton, over some particularly steep and nasty mountains that just happened to lie between the two towns. We had ridden some of this route previously, and we thought we had a good idea of what was in store for us today. A mad uphill start to soften us up and get the heart pumping, followed by a short, sharp descent before the big climb of the day awaited us. We had been hearing all sorts of rumours about this climb, but no one really knew what to expect. Apparently it was completely unridable, and even the pros would be walking. This is what I hate - having an inkling of what lies ahead of me. I prefer to tackle the obstacles as they come, and not have to worry about the pain and suffering that will be dished out later in the day. 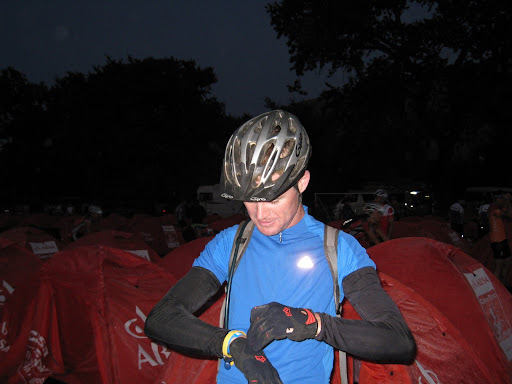 Craig, on the other hand (Darren), likes to know details like this, as well as distances to water points, climbs and other interesting obstacles along the route. A good nights sleep, and ready for the stage. I could do with a few more hours of sleep. Team Lefty and Fox were in high spirits this morning after yesterday's victory over us, although Cillier was already starting to take strain. His Achilles heal was not his heal at all, but rather his bum. And it was starting to ache. It is always quite funny to laugh at another's discomfort as long as it doesn't happen to you. We've all had bum sores, so we knew exactly what he was going through, which made it quite funny! Etienne, preparing for a cold morning ride in the Overberg. Right from the start we started climbing, and would continue going up for about an hour in the hills above Villiersdorp. Having ridden this section previously, we knew where to push it, and where to catch our breath. 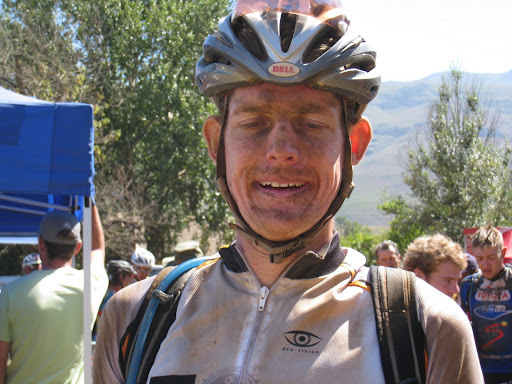 The only difference this time around was that there were over a thousand other cyclists competing for the same patch of dirt that we were on. And when one rider gets it wrong and has to dismount, we all have to dismount. And yet there is always one guy who refuses to wait his turn and insists we all get out of his way. Another team onto my list. Craig seemed to cured of whatever had been affecting him on day one and two, and rode like the clappers (when we could ride) up that first hill. 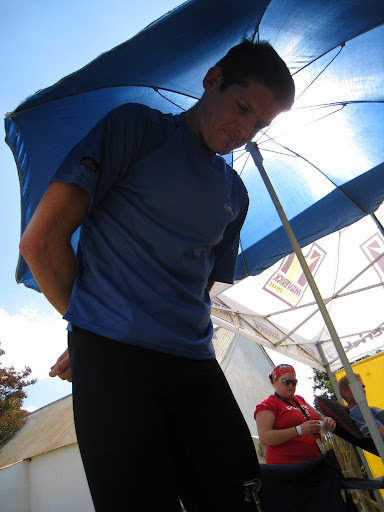 The sweat was pouring off me, and I was frantically trying to stay hydrated, and within touch of Craig. 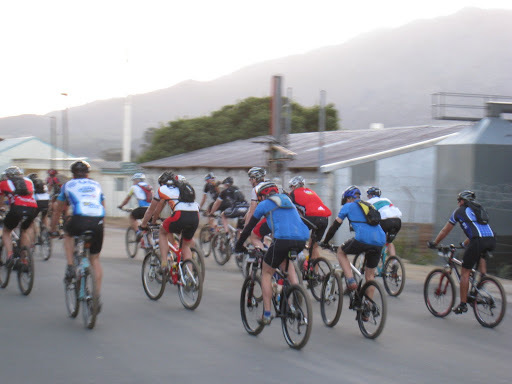 The leaders racing up the hill out of town. We made the top of that first hill in good time, and had a short sharp descent on some off-cambered jeep track to deal with. In the trial ride I had struggled quite a bit here, and so went ahead of Craig. To my surprise, I made it through without any mishaps, only to hear Craig connecting with mother earth twice. I was quite chuffed that I had ridden a downhill section better than Craig - doesn't happen too often. Luckily, they were gentle crashes and no damage was done. The faffers shadowing us closely. Once at the bottom, we raced through the first water point without stopping, although this was going to play on my mind for the rest of the day. Just to make sure I stayed topped up, I ate my banana and had a Gu. We had a fast section ahead of us to the bottom of the big climb of the day, and to our disappointment, the faffers were right behind us. 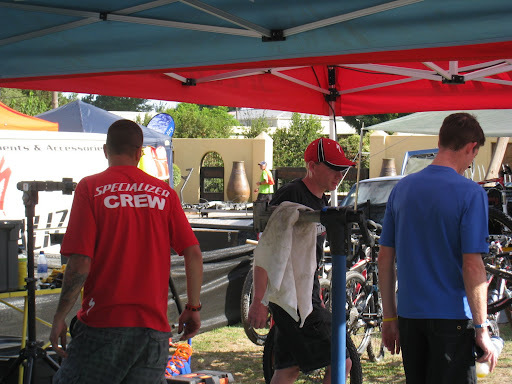 We hadn't been able to loose them at the waterpoint. 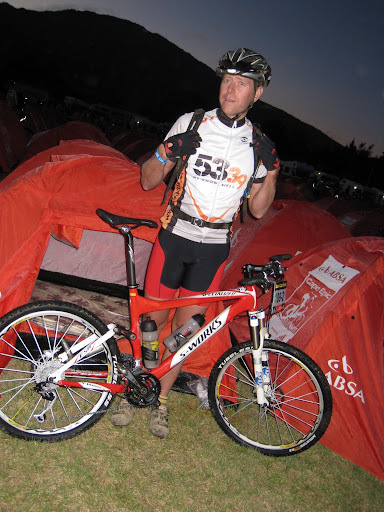 Ask any first time rider what they were most worried about for this year's Epic, and they would mention the 3km portage on day 3. Now I have done quite a bit of walking with my bike on my shoulders in previous Epic's that I wasn't too worried about the little walk that lay ahead of us. How hard can it be? 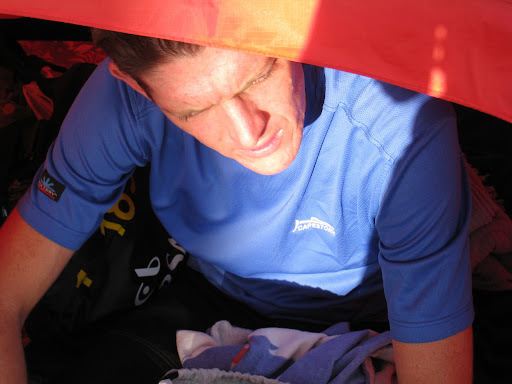 As it turns out, I should have been worried - this was the toughest portage I have ever done. To get an idea of how steep it was, when I looked ahead of me at the next rider about 2 meters in front of me, all I saw were his ankles. I heard one rider saying that for ever 25 steps he took, we were climbing 10m. This was the section that Mark Fish had to pull out on, after walking in his socks because of the size of his blisters. Mark Fish, in his socks. 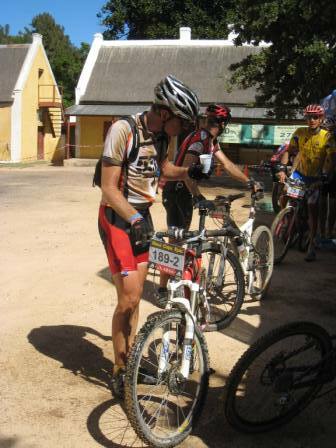 Every now and then, we would get a break, and be able to ride for a couple of meters before the path turned up again. In places it was so steep that there was no option to push your bike - you had to carry it on your back. Now imagine me, and my amazing upper body trying to get this right. In those 3 kms, I think my arms muscles doubled in size! In addition, I got another compliment from Craig - "Not bad going for someone who doesn't run". He quickly made me pay for that compliment - as soon as we could ride again, he put the hammer down and flew up the remainder of the hill. I had no choice but to hang on for dear life. My calves were paining, my quads were aching, my back was sore, my arms were wobbly - and yet we flew up the rest of that mountain. The payback was some nice fast downhill where we were able to make up some good ground. Just before the next climb, with Craig on the front and me right behind we took a wrong turn and ended up in a dry river bed, with no sign of where to go next. And to top it all off, the guys who had been sucking our wheels have the cheek to moan and complain about us leading them astray. We had a short climb ahead of us, followed by a long, fast downhill section, back to the valley floor. All the guys we had lead astray were now ahead of us, and holding us (more me) up on the descent. This seemed to be the trend for the rest of the day. Guys climb better than us, and demand we move over for them, but when it comes to the downhills, they don't return the courtesy. We reckoned that they must be roadies, or come from some place that is very flat. Like Holland. 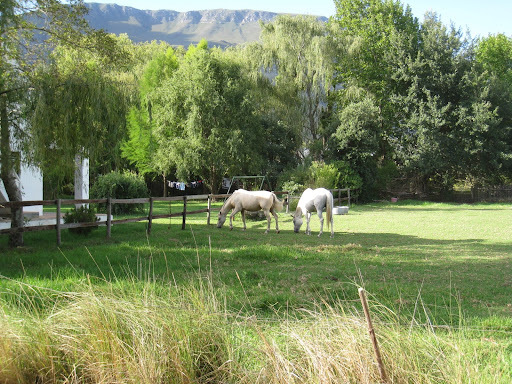 When last did you see a white horse? Back on the valley floor, on a wide district road I was still suffering from all the hiking, and let Craig do all the work on the front. I don't think I had done an ounce of work all day, other than just trying to keep up. The good news was the faffers were nowhere to be seen, after spending the morning shadowing us, they had finally dropped back. 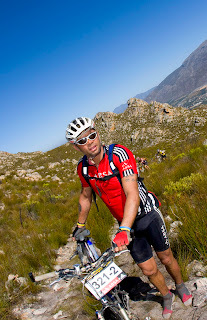 Craig, making everything is still ok.
With Greyton around the corner, the Epic route organisers had decided to take us into the hills again, in an effort to make up some distance. We had the treat of riding some really nice uphill single track (and doing a little walking too). I was starting to feel good, but at the same time Craig was fading. I reckon that on the day when we both feel good at the same time we will have an awesome ride. 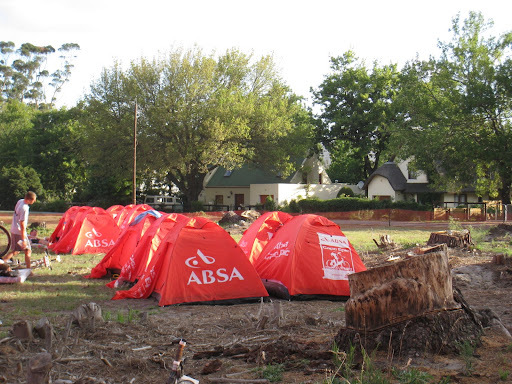 Our tents, in the "bad" neighbourhood - near the Brazilians. 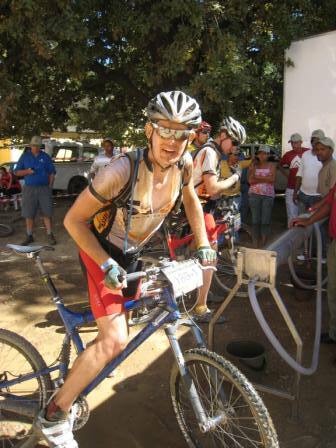 The last water point of the stage was with 9kms to go. You just know they have something torturous planned when they do that. In comparison with the mountains we had already been over, the last few kilometers were nothing, but with 2 and a half days of riding in our legs, we felt them. And we suffered. Sometimes it is easier to admit defeat and hop off and push, rather than try to ride, and Craig and I were doing plenty of this. Unfortunately, this meant that the guys who go uphill well were able to pass us, and become obstacles for us on the descents. That was tough, and dirty! 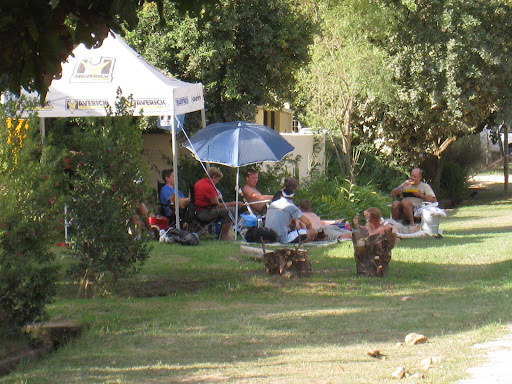 We finally made it into Greyton, past our waiting supporters, to the finish line in a respectable 4:41. This would give us the whole afternoon to rest, eat and recover, and I certainly needed to recover. My legs were quite knackered from all the walking, and the afternoon massage was one of complete pain. I had knots and aches everywhere, and I think Jayne quite enjoyed working them out. It was reassuring to know that as sore as I was, Cillier was going to be in more pain, and be far more expressive about it. Our spot along the finishing straight. 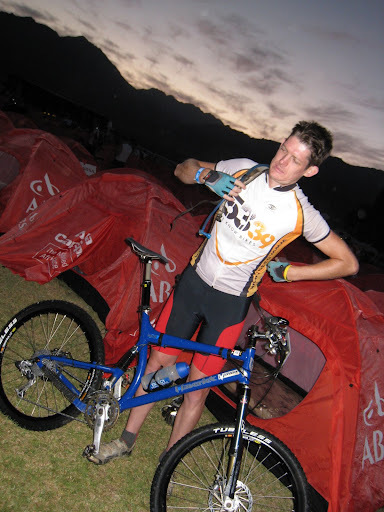 Just our luck - I thought we had escaped the noisy Brazilians once we left Villiersdorp, but it soon turned out they had followed us, and once again, were camped out in the row behind us. The only blessing was that they were starting to feel the exertions of the Epic, and so there loudness and chatiness was being affected. I think Brazilians are uncomfortable with silence, and will use any opportunity to fill it, at the top of their voices. Good thing I had ear plugs and a sleeping tablet! Lowlights of the day: Mountain goats who can't go downhill fast!